Normally, the hobby overlooks relievers. Trevor Hoffman cards and autographed memorabilia are a bit of an anomaly. Spending 15 of his 18 major leagues seasons were spent with the San Diego Padres, he became a fan favorite and was instrumental in the emergence of the closer role having star power. He was the first reliever to accomplish the benchmarks of 500 and 600 career saves. Hoffman has just one rookie card. It is part of the 1992 Bowman Baseball set. He also has a lengthy pre-rookie card checklist from his playing days in the minor leagues. 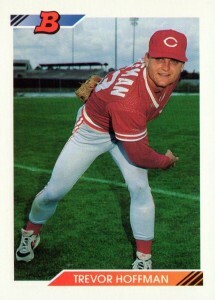 One of his most popular is his 1991 ProCards Cedar Rapids card. 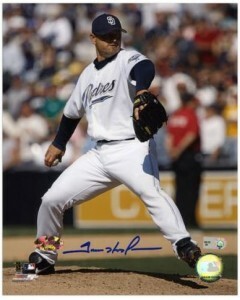 The first certified Trevor Hoffman autograph cards were issued in the 1996 Leaf Signature Series set. The base version has a known print run of 3,500 copies. Two parallels also exist, a Silver and Gold, with respective print runs of 1,000 and 500. None of the cards are serial numbered. Hoffman's first memorabilia card was released in 2000 Fleer Impact. The Genuine Coverage card contains a swatch of game-used batting gloves. Trevor Hoffman's autographed memorabilia is relatively affordable. He is still involved with the Padres in a coaching capacity and is a willing signer at the ballpark. The 1992 Bowman Baseball set is one of the more popular releases of the early 1990s. The inclusion of key rookie cards like Trevor Hoffman is a contributing factor. The set also has the lone Mariano Rivera rookie card. The quality of the product itself is another reason collectors appreciate the set. It was printed on a glossy white card stock, which gives it the look and feel of a premium product. 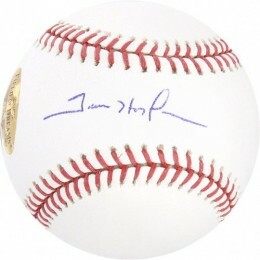 Below you will find an example of what Trevor Hoffman's authentic signature looks like. This can be used as a first point of reference for determining the legitimacy of autograph memorabilia, but is not a substitute for having your items authenticated by a well-respected professional autograph authentication company. Some of the trusted sources within the sports memorabilia market include the following companies: PSA, JSA, Steiner, Mounted Memories and Tristar. Click on any of the images below to view full size photos. The signature is written on a slight arc. The letter "t" is unique. It resembles a "7" with a long horizontal tail extending to the left. A scribble implies the remaining letters of the first name. The "H" is discernible. The first of the two vertical lines has a curve to it. The lines are not always connected by a horizontal line. A small "o" is visible. A large "P" shaped character is actually an "f."
The signature finishes with a downward sloping line. 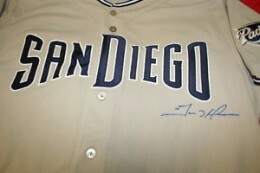 TREVOR HOFFMAN SIGNED AUTOGRAPHED 6x8 PHOTO PSA DNA SAN DIEGO PADRES AUTO HOF!!! 2002 UPPER DECK VINTAGE #228 TREVOR HOFFMAN PSA DNA " AUTO "